Ken I find this shot hugely compelling yet strangely confusing, the three main elements all seem to be vying for your attention. The railway line seem to be dragging your eyes away from the silos, then there's the "pick me, pick me" sunset sky, and the silo silhouettes. Each is a strong element on its own and so my eyes don't know quite where to focus. Well Pete, you must not be the only one confused here, because you're the only to respond in 10 days! I agree that there is a lot going on here, and the rail lines do tend to draw the eye in...but to where is likely different for different folks. 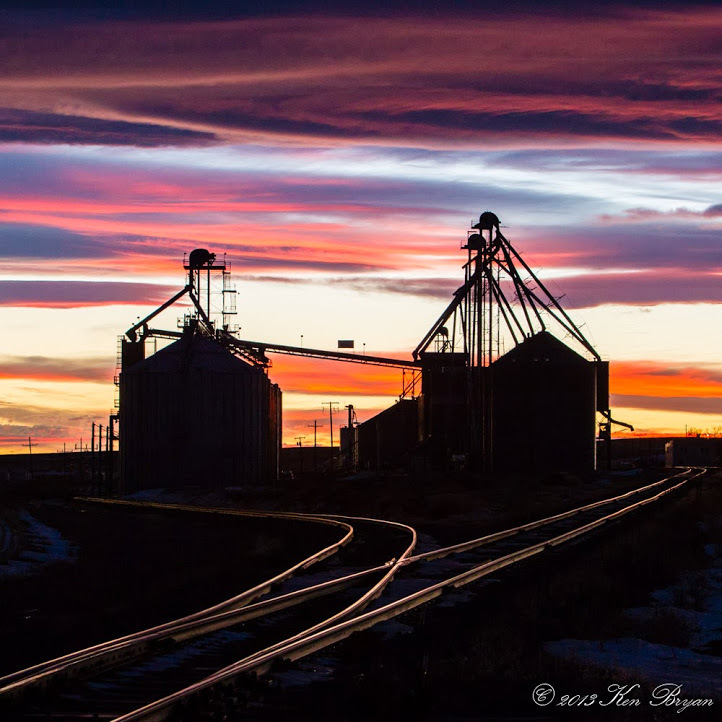 PhotoJohn talks about having 3 elements to make a successful composition, which this does with the rail, grain bins/elevators, and sunset...but the duplicate rail and elevators may confuse the matter here. Truth be told, it was a fascinating sunset that was begging to have something silhouetted in front of it, and this was the only interesting structure I could find along the highway before the colors in the sky died out. Thanks for your input on this image, I appreciate your thoughts.